Bench Theatre take us through the quantum multiverse in their latest production. Constellations by Nick Payne is a boy-meets-girl tale with a twist. It follows Roland, a beekeeper, and Marianne, a cosmologist, through their romantic relationship. When the two meet at a barbecue, a multiverse of potential outcomes unfolds. Each choice they make creates a series of branching paths; the play shows a series of vignettes showing the effects of free will and chance in our lives. Scenes are repeated, often with different outcomes. It was this variation and mashing of genres that made Daniel Finch want to make this play his directorial debut: ‘It was the simple fact that every part of the script appealed to me – it explores free will and friendship, quantum multiverse theory, love, and honey. ‘It is a stunning piece that will make you think about life, love and the thousands of small decisions we all make each day. That sounds a bit heady, I know, but that’s the beauty of Nick Payne’s writing – it encompasses huge scientific ideas inside a lovely, grounded and very human story. Although the play is relatively short, the repetition of scenes is incredibly challenging for actors to take on. 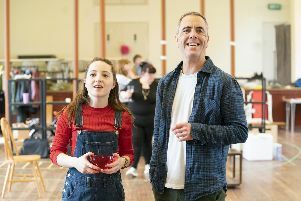 Stuart Reilly and Faye Williams are performing the roles of Roland and Marianne and they have had their work cut out for them over the last few weeks. Faye says: ‘Constellations is one of the most enjoyable and challenging plays I’ve ever had the pleasure to be involved in. The idea of setting a play within a multiverse is wonderful – we get the many different sides to Roland and Marianne that an audience would not always see with a conventional play.